Greek Islands Cruises - Top 10 Places To Visit! Greek Islands cruises allow you to see many different islands on one vacation, instead of picking just one or two when you fly. Because they number more than two hundred, picking which islands to visit can be a busy task. Luckily, there are small ships like the Blue Star Ferries that have itineraries that include a multitude of destinations. Here are the top 10 places to visit on your tour of the fabulous Greek Islands. Looking for the true taste of Greece? Then look no further than the island of Sifnos, where it is mostly Greeks, not tourists admiring the sights and beaches. What Aegean Cruise would be complete without a stop in Mykonos? This is the party island, one which boasts the best beaches, the best nightlife and the non-stop activity that makes it popular with the rich and famous. Naxos is the largest island in the chain, boasting mountains, historical locations and a boardwalk with little shops and cafes. A Greek Islands Cruise won’t be the same until you visit the lovely Paros. This island boasts a charm and grace with cobblestones, archways, gardens and a calmer pace. Ios is great for the younger crowd, as it has all the nightlife and ‘go’ as Mykonos does, but for those who have less money to spend but still enjoy the crowds. 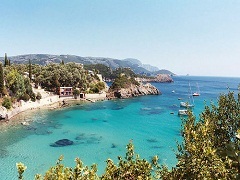 If you are more nature minded than party minded, then Corfu will be a stop for you to look forward to. With its mix of influences, a fortress or two and lots of natural elements, it’s an island to explore rather than experience. All the things to do in Santorini make this a great island to visit. It has volcanoes, the best sunsets and volcanic sand beaches for that taste of the unexpected. A change of pace can be had on a Greek Islands cruise when you stop in Skiathos, the most northern of the islands and one filled with pine trees, coves and beaches. Crete is perhaps the most well-known of the Greek Islands; it is the largest and has something for everyone. There are mountains, beaches, nightlife and lots of things to do. Rhodes is a throwback to the old world, full of history and museums. This Medieval old town is charming and certainly worth a stop. Greek Islands cruises certainly have something for everyone, whether you arrive in Greece and go on your tour from there or it is included in Greece and Turkey cruises from another destination, you will love the differences, the beauty and the uniqueness of this part of the world.